Would hardwood floors drastically change the look of your home? Learn how to lay a hardwood floor down with hard work and a few supplies. 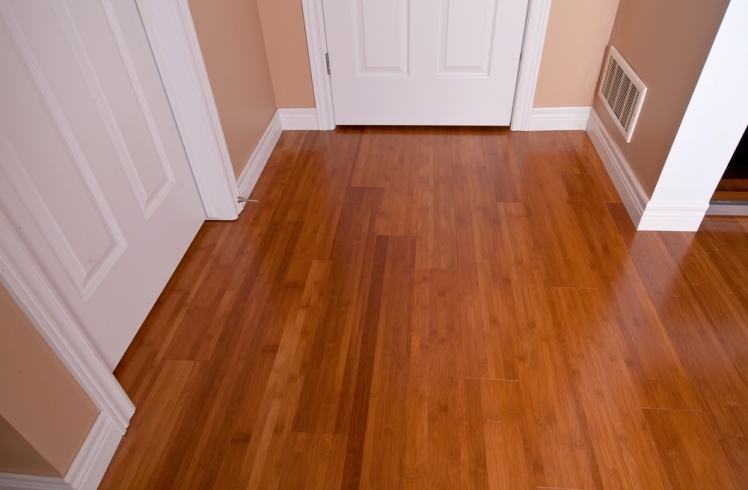 Homeowners can transform their space with flooring that stands up well in high traffic areas. Before getting started, it is important to prepare the space. No one wants to be working to lay a hardwood floor only to stop midway through the project to move a piece of furniture or deal with an unforeseen issue. Instead, evaluate the space. Take note of how corners will come into play as you begin to work. Create a border around objects that are going to be obstructing the flow of the floors. If you are removing flooring before the hardwood floor installation, make sure to take everything up and then vacuum the floor to get rid of any dirt or debris that could be trapped under the floors. Another important part of preparation is getting all of the materials you are going to need. You don’t want to be halfway through a room and find that you don’t have enough wood or you didn’t purchase the right door transition. In addition to the actual flooring, hardwood floor installers need a number of tools to complete the project. 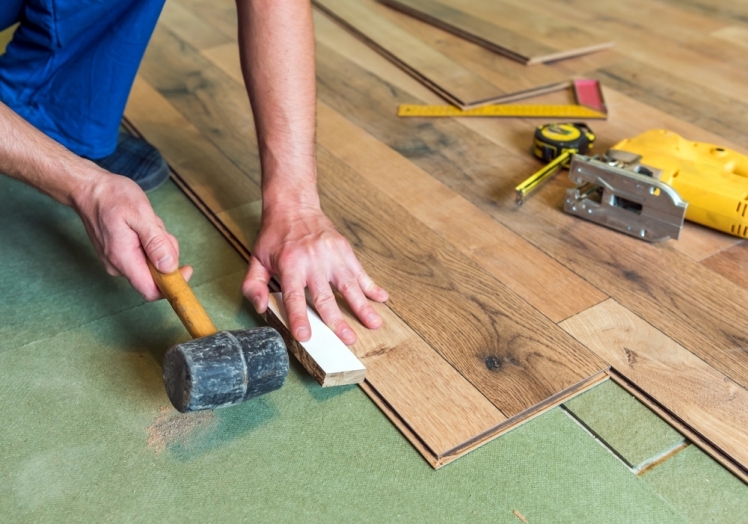 A tape measure, table saw and jigsaw will help as you cut pieces of flooring to fit the space. 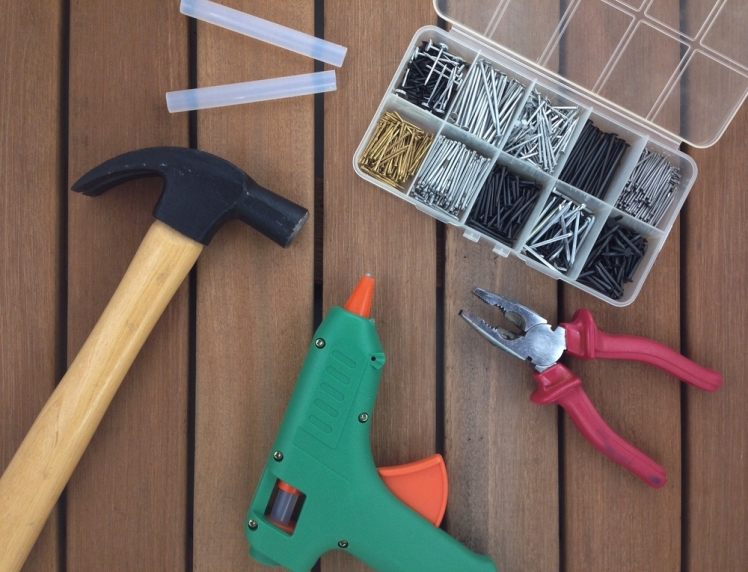 A mallet, nail gun and flooring nailer will help you keep the wood in place as you work. A hammer, drill, pry bar and nails will also come in handy. Don’t get started unless you have all of these items on hand. This is often the most important step of the entire process. The first row will determine how the rest of the room is going to look. This is a great time to measure, check, and then measure and check again. Start at the longest wall that is uninterrupted. Create a line that ensures the flooring runs perpendicular to the joists of the floor. After this is complete, you can pre-drill holes for the nails. The first and last row of boards are the only pieces that will have nails on the actual face of the board. Pre-drilling helps to preserve the look of the pieces. Lay the first piece of wood down and use the nails to attach it. Keep going until you have reached the end of the row. The very last piece will probably need to be cut down in order to fit precisely. It can be tempting to do the exact same thing for each row of flooring. But the layout will look stiff and take away from the overall look of the room. Instead, open up several bundles of wood and begin to create rows that are varied in length. The goal is to have each row looking a little different from the one above and below it. Professional hardwood floor installers call this racking the boards. So spend some time picking out your pattern or just creating a lot of different looks. This means that each of the rows will require some type of cuts in order to complete the row from one wall across to the other. Use the piece you cut on another row to help with the variations. As you do this, take a look at the appearance of the different boards. You may want to make changes so that you don’t have sections that are noticeably lighter or darker than other parts of the floor. Once this is complete, you can start to get into a rhythm as you connect each of the rows to the previous pieces. As soon as you are far enough out from the wall, you can begin to use the flooring nailer. This helps to create an even look throughout the room. Take your time as you continue to work. You also want to keep an eye out for boards that are bowed. If you see any, take them out and replace them with others. There is a chance that you may not need these pieces. They may just end up as extras. Every once in a while, take a break and step back to get the full view of the room. This will help you see any issues that you might not have noticed as you worked. It also allows you to see the transformation of the room and encourages you to keep going forward as you work on hardwood floor installation. Wood floor installation takes a lot of effort, and you want to take a moment to enjoy the changes in the room along the way as you lay a hardwood floor. Just like the first row, when it comes to installing hardwood floors, the last row is going to be a little different. You’ve been cutting the length of the boards the entire time to help fit them into the rows. But now, with only a certain amount of space left, you will probably need to cut the boards lengthwise to get them to fit into place. You want to make sure that you have all of the boards together without any gaps before you measure and cut. These pieces will also be nailed on the face of the wood to keep them in place. Wood floor installation is hard work, but a homeowner can handle the task and be proud of the look he or she created. Think you are done with installing hardwood floors? Flooring installers know that the job isn’t done until the trim is set up around the entire room. The floors are done, but something needs to help with the gap between the floors and the walls. The trim does more than just cover up the gap. It also serves to add an aesthetic appeal to the space. The baseboard will lie flat against the wall and be nailed into place. Trim comes in a variety of styles so flooring installers can choose the best option for the room in which you intend to lay a hardwood floor.